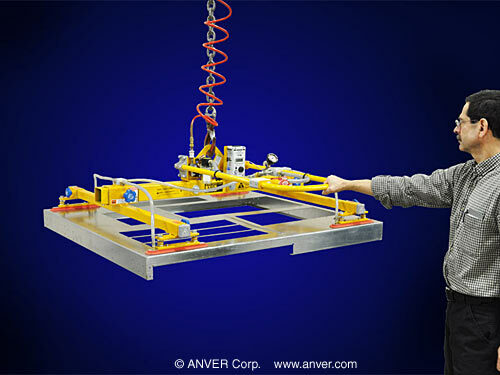 A new modular vacuum lifter equipped with adjustable X-Y beams and narrow suction pads to let one person handle large loads previously requiring two people is being introduced by ANVER Corp. of Hudson, Massachusetts. The ANVER VPFL4 Series Vacuum Lifter is a low-profile, below-the-hook unit that needs only 8” of headroom and is equipped with adjustable X-Y beams and narrow rectangular suction pads for picking up large, awkward loads. Featuring an all-welded steel frame with a vacuum reservoir, this light duty lifter allows one to person handle large electric panel frames, chassis, and similar loads weighing up to 100 lbs. that previously required two people. Suitable for assembly, stamping, and packaging operations, the ANVER VPFL4 Series Vacuum Lifter is powered by compressed air and controlled by a control valve with a safety lock. Standard features include an air filter, vacuum check valve, vacuum gauge, and an audio-visual alarm that activates in the event of a vacuum loss or if leakage occurs. 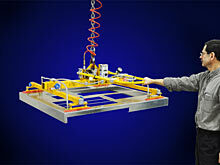 Various size beams and suction pads are offered and an electric vacuum pump is optional.